Free print and colour Christmas card. Well soon to be that season to be jolly! So I designed this Christmas card of a surly reindeer who simply isn’t impressed with Santa’s orders. Feel free to print him out and make your own home homemade card. Phoebe and I will have a go and post up some pics of our efforts. 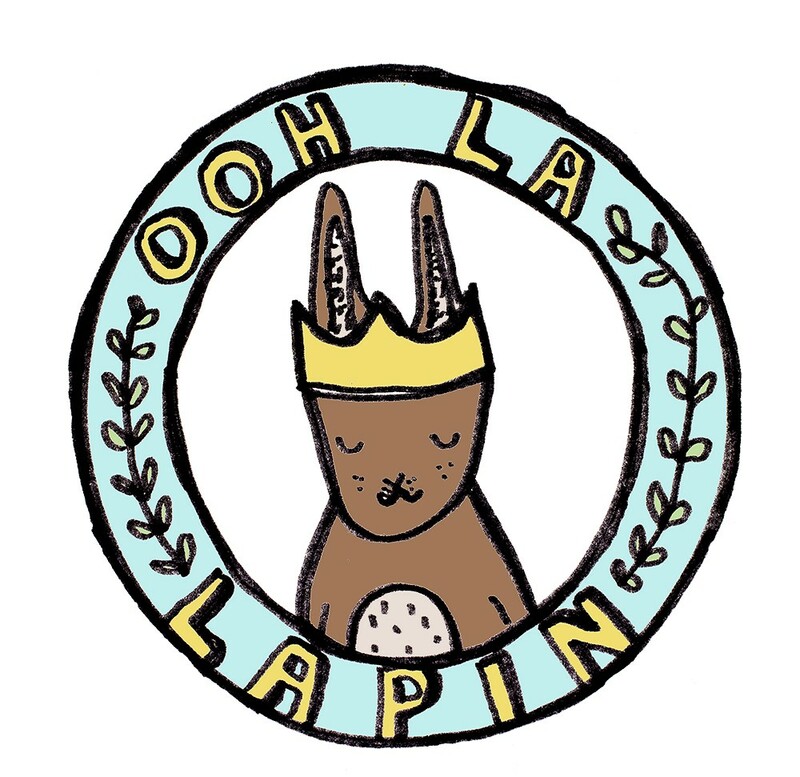 Its been a busy time what with the Ooh la Lapin at home sale coming up on the 6th November, it starts at 1.30pm and will be a treasure trove of crafty fun. Just contact me for the address, its a my house! Plus news coming soon of a days tuition at the Kings Theatre. `I loved the Wes Anderson movie and watched it again the other day with my daughter, I came across this on Burda Style a while ago. The designer even hand painted the tiny apples onto the fabric! 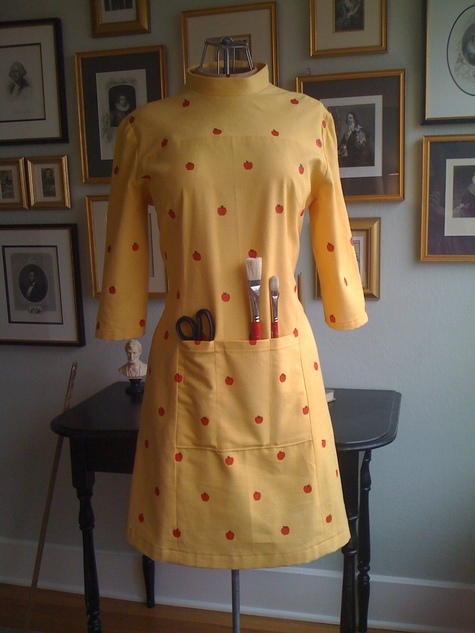 I really want a Mrs Fox dress so I guess I will have to put into my brain store with all the other sewing projects I am supposed to do!!! At least until after Christmas. 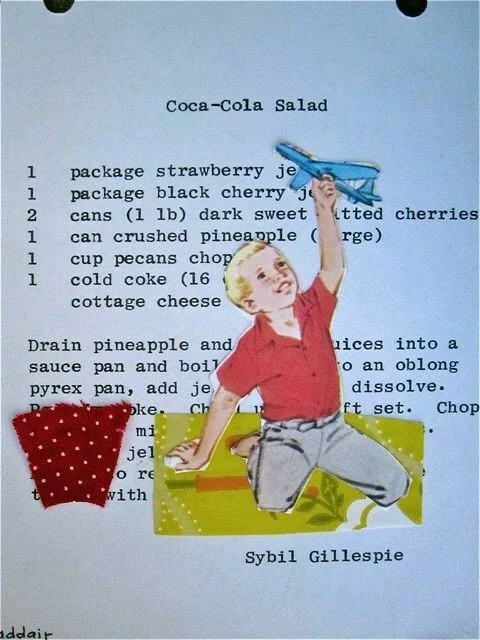 After the demise of my previous blog ‘southsea food girl’ I think its only right to occasionally share a recipe or two on here. 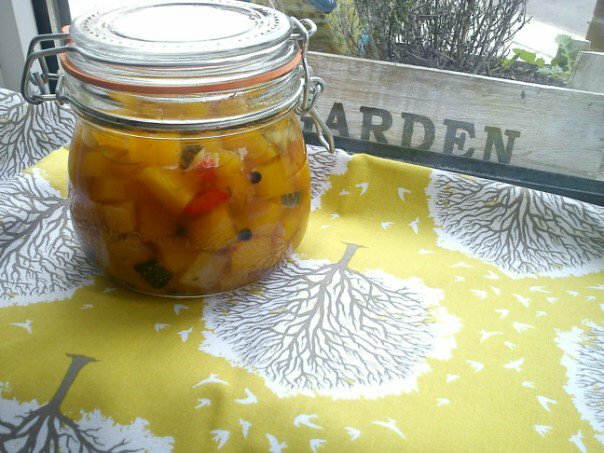 So this morning I set about making Pumpkin Pickle. Its my own recipe kind of adapted from a Finnish one. mix the liquids with the herbs, sugar and pepper in a steel pan, heat gently. You should end up with 2 large jars or 3 small ones. 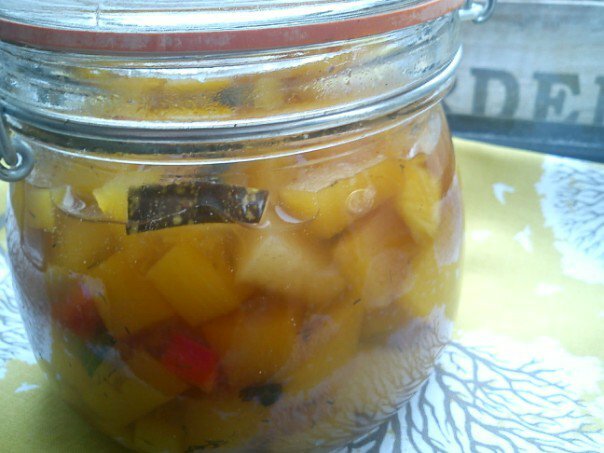 keep in the fridge or cupboard over the winter and use when you want. It really does taste good, especially with smoked ham or Gammon and strong cheese. 1. Us Brits are still getting to grips with Pumpkins and cooking them, so instead of wasting them by making rubbish lanterns make a pie instead. It tastes better and your friends will love you more when you offer it round, click the pie pic for the recipe! 2. 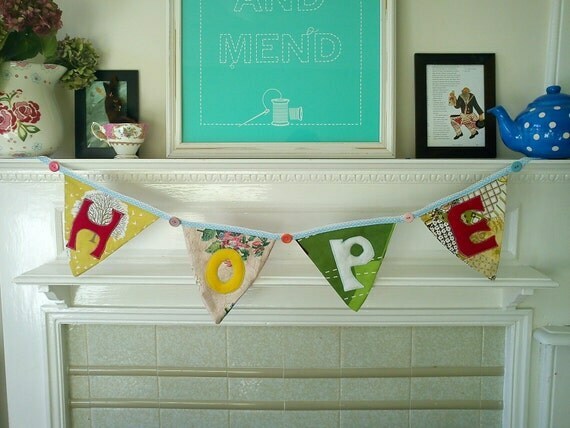 Make a hanging garland, a simple one can be uncomplicated and easy. Or copy the one I made above which takes a bit more time but it will look very pretty! 3. Kew Gardens are having an Autumn Festival, hooray for Kew, its a super place. If its a trek then just check out your local gardens/stately homes for beautiful colour. 4. Use up old yarn (or an excuse to buy more/learn) and make ‘granny squares’ to start forming your own delightful crochet blanket. 5. Support UK farmers buy buying from them. Many fleeces just get burned because farmers cant get any money for them and inevitably they go out of business. The event hopes to highlight the plight of sheep farmers around the world and in Britain, where the cost to shear a sheep now outweighs any profits from selling the fleece. Certain fleeces can be worth as little as £1, resulting in a great number of farmers loosing money. Today’s leading producers of wool are Australia and New Zealand where prices are at a 50-year low. This price collapse in wool production began in 1966 and has continued in a downward trend since, sadly forcing many of the world’s sheep farmers out of business. Try Wingham Wool Works, for UK yarns including Herdwick sheep, oh lovely Herdwicks! look at its cute face! A handmade blanket can mean so much to a sick child. “Give someone a hug today. These were the poignant but inspiring words of the mother of murdered teenager Jimmy Mizen. We cannot reach out to every distressed child but we can help to provide them with tangible evidence that someone cares, along with the physical reassurance that comes with being snuggled up in a quilt and the lift to the spirit from the bright colours and cheerful patterns sewn into it. To give an opportunity for needlewomen across to UK to contribute to their local community. I heard about this charity via an interview with maker Sarah Fordam in Etsy UK. Her Mum contributes quilts to it and I thought, what a super idea. Anyone wanting to have a go or donate just click on the pic at the top. A couple of months back on Etsy I found this seller and asked her if I could post up her profile statement (see below). Click on the pic to see her Etsy. I found it really inspiring and hope you do too. I was walking through Bushwick, Brooklyn today and saw a graffiti slogan. In blood red paint it read, “You are not your neighborhood.” I think I understand that the author was reminding us that our worth isn’t measured by the status of our surroundings but I don’t think we can easily separate ourselves from the places and communities we inhabit. Most of the places I’ve lived and the people I come from are earthy coal miners, rootsy housekeepers, and jolly school bus drivers. My gypsy mother took me temporarily to luxury, status, and higher education. She now has a small farm in Northern Virginia. Being exposed to the extremes has given me a healthy dose of audacity. Statistically, I should’ve been a teenage mother with a substance dependency, who didn’t finish high school. Seeing a variety of ways to do life coupled with having a couple of big dreamers for parents, I’ve tried to take life on my own terms. So, here I am… figuring out the thing I really want to do inconveniently late, with the proper steps tumbling out of order. I’m just naive and idealistic enough to do it anyway. I paint and craft because I obey a visceral impulse and have learned to rely upon and adore the creative process. I’m figuring out the rest as I go. At times, I feel ridiculous venturing into the world with ideas and paintbrushes in tow. But a quick review of my options, and I realize that deciding to turn away out of fear of ridicule would leave me empty, angry, and subdued. And so, I create and learn all I can along the way, despite it all.